Pictured in the back row, from left, are Adam Gradert, Logan Hebert, Devon Boyer, Aleck Main, Cassie Perrin, Robert Scholl and Hayden Wilder. In the front row, from left, are Gage Hank, Blake Hennenfent, Morgan Carrick, Jeremiah Cupps and Drew Lamle. 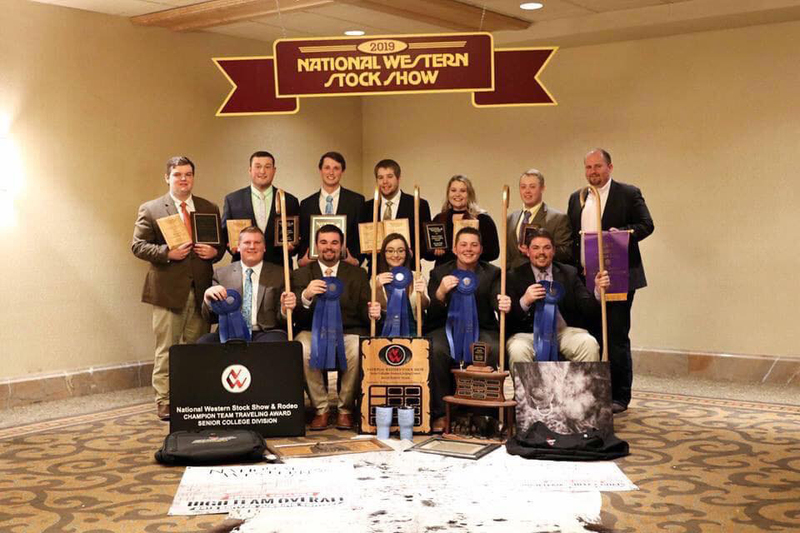 MACOMB, IL – The Western Illinois University Livestock Judging Team finished first in the senior college livestock judging contest at the National Western Stock Show over the weekend in Colorado. • Swine: 3rd place team; Drew Lamle, a junior agriculture major of Fort Wayne, IN, was third individually; and Blake Hennenfent, a senior agriculture major of Gilson, IL, was fifth individually. • Sheep and Goats: First place team; Morgan Carrick, a junior agriculture major of Blanchard, MI, was fourth individually; and Jeremiah Cupps, a junior agriculture major of Burlington, KY, was seventh individually. • Cattle: Third place team; Gage Hank, a junior agriculture major of Aledo, IL, was sixth individually. Team was fourth in cattle reasons. • Reasons: Third place team; Hennenfent was fifth; and Lamle was sixth. • Overall: Carrick was seventh overall and Lamle was eighth overall. • Carload Judging Contest: Fourth overall team and Cassie Perrin, a junior agriculture major of Coopersville, MI, was second high individual and Devon Boyer, a junior agriculture major of Blandinsville, IL, was 10th. The team is coached by WIU Associate Professor of Agriculture Mark Hoge and WIU MBA student Hayden Wilder, of Remington, IL. "This win is a tremendous milestone for our program," said Wilder. "It marks the first time that the WIU judging team has won Denver in many, many years. This group of students has worked incredibly hard for the past month. They are absolutely dedicated to progress and improvement - I believe that is the key reason they were able to experience so much success right out of the gate. Looking forward, we will need to put this win behind us and keep working harder than ever, because the field is extremely competitive this year." The team heads to Sioux Falls, SD Friday for a contest at the Sioux Empire Farm Show. For more information about the WIU School of Agriculture, visit wiu.edu/agriculture.